So anyway, here I was at the grocery store looking for the very few items I had planned on cooking, when suddenly the TV screen caught my eye. There was a young woman on the TV screen who was describing this new recipe. It sounded easy and very appetizing: Chicken Florentine Bake, and the store had everything gathered right in front of you. Well you can say that they got me:-) because I did not go home with the items I needed but rather a whole list of things…..
For this recipe, you will need: 1 cup frozen of creamed spinach, 2 cups of Deli rotisserie chicken (chopped), 8 oz of fresh mozzarella cheese (divided), 1/2 cup of whole milk, 1 (10-oz) container Italian cooking cream, 1 large egg, 1 (4-oz) jar diced pimientos (drained), 3/4 cup of Deli roasted tomatoes, 1 cup of quartered artichoke hearts (drained), 1 cup of fresh sliced mushrooms, and 1 bag of 16 oz gnocchi pasta. Preheat oven to 400 degrees F. Microwave spinach on high 2-3 minutes to thaw. Remove chicken (breast only) from bones; cut into bite-sized pieces. Cut mozzarella cheese into bite-size pieces. 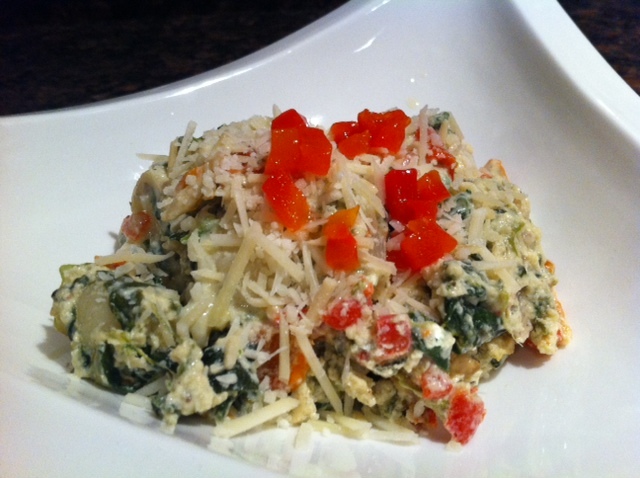 Combine in a large bowl, spinach, milk, cooking creme, egg, pimientos, and 1 cup of the cheese. Stir in chicken, tomatoes, mushroom, and gnocchi. Transfer mixture to a 9- x 13-inch baking dish and cover with foil; bake 25-30 minutes. Uncover and top with remaining 1 cup cheese. Bake 8-10 more minutes or until bubbly and cheese melts. Let stand 2-3 minutes before serving. I thought it was very good. My kids were not fond of it because of the spinach and the tomatoes. My husband said “It was good, but you don’t need to fix it again.” I guess that was a hint for saying, please don’t repeat. Ahhhh, what I am going to do with this family?!?! It is difficult to steer them away from the beef potato theme….